Kencove's Double Nail Pin-lock Insulators have a large spark flange around the base to prevent arcing. The wire is held in a slot by a removable pin with plenty of space for wire movement to keep friction to a minimum. The wire can be removed from the insulator while it is still under high tension. This allows the wire to be easily dropped from about 4 posts to drive over it occasionally. 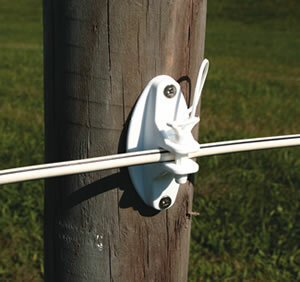 These insulators have two holes for nails, wood screws or staples to make a strong attachment to the post. The plastic is high quality - not brittle, even after many years of weathering in sunlight. These insulators have the strongest designs and quality plastic needed for the abuse and life that the normal high-tensile fence is expected to handle. Accommodates high-tensile, electric rope and Hotcote®.